Image Comics is thrilled to announce that issue #54 of Brian K. Vaughan and Fiona Staples’ multiple Eisner Award-winning series SAGA—which marks the “season finale” of the space opera’s ninth arc—is being fast-tracked for a second printing in order to keep up with overwhelming customer demand. 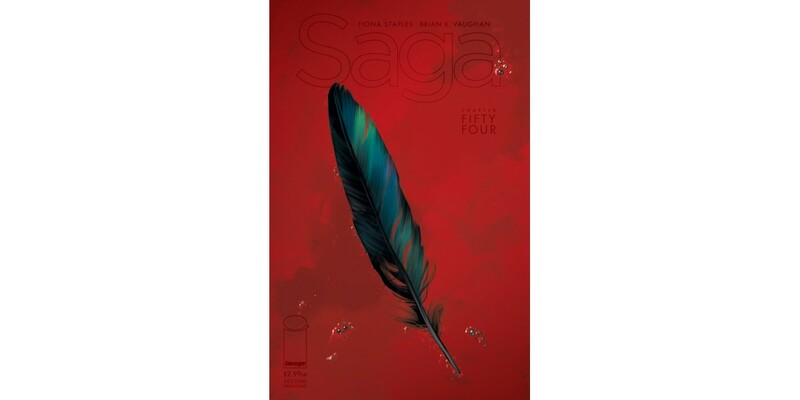 SAGA #54 will remain available for purchase across all digital platforms, including the Image Comics website (imagecomics.com), the official Image Comics iOS app, Comixology’s website (comixology.com), iOS, Android, and Google Play. SAGA, VOL. 9 (Diamond code: JUL180297, ISBN: 978-1-5343-0837-4) hits comics shops on Wednesday, September 26th and bookstores on Tuesday, October 2nd. It can be preordered via Amazon, Barnes & Noble, Books-A-Million, Indiebound, and Indigo.